"In Christ – a new community"
Participants: The first Assembly in a developing country comprised 250 delegates, 437 advisors, observers, staff and visitors. 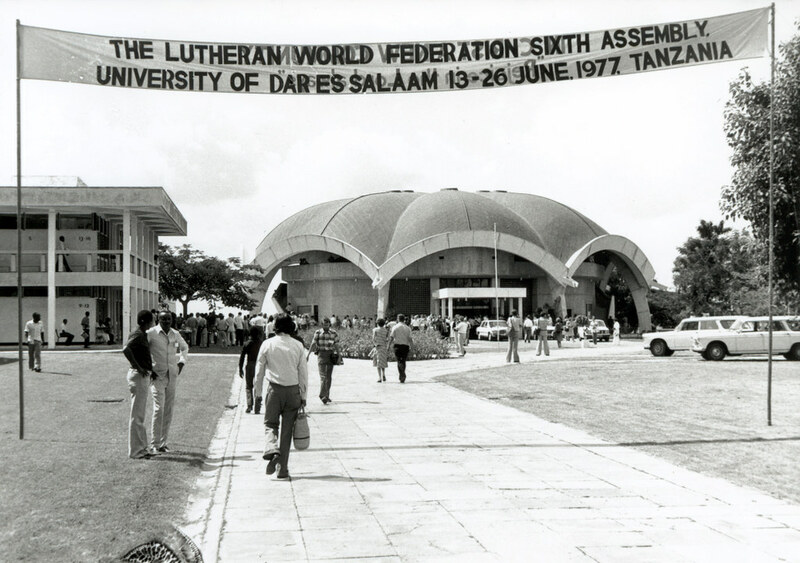 Forty percent of delegates were now from the developing world, up from eight percent in Lund. The number of women delegates approached the targeted 25 percent. Highlights: Delegates declared that the racial separation of the church in Southern Africa constituted a status confessionis or a matter on which there was to be no discussion. They recognised women as equals to men at all levels of the life of the church, endorsed “reconciled diversity” as the lead theme of the ecumenical engagement of Lutherans, and studied the “root causes” of social and economic injustice. The warm welcome by the Tanzanian host church and the local community profoundly influenced the mood of the whole Assembly. Meeting on the African continent was for the African churches a sign of recognition of their full membership into the worldwide Lutheran communion. Topics were no longer determined exclusively by the theologians of the North. Issues faced by African churches on their own continent came to the fore. This Assembly brought to the fore the need to intensify involvement in social-ethical issues and to advocate for human rights on the basis of the Lutheran Confessional Heritage. Discussion on the ecumenical task and vision of the LWF received almost as much attention. The statement “Models of unity” endorsed the notion of “reconciled diversity”, presented as a complement to the concept of “conciliar fellowship”.